December 6, 2018, Baku – Starting from March 31, 2019, the low-cost airline Buta Airways will launch direct flights to Turkey’s capital Ankara. Ankara will be the low-cost Airline’s forth destination in Turkey. The Airline is already operating regular flights from Baku to Istanbul, Alanya and Izmir. The minimum fare for Baku-Ankara flight (Esenboga Airport, IATA:ESB) like for other destinations of the Airline, will cost 29 euros (one way). Flights will be carried out twice a week – on Tuesdays and Sundays. Air tickets can be purchased on the official website of the Airline (on "Budget" and "Standard" fares), as well as at sales offices (on "Super" fare). Being a low-cost airline, minimum fare Budget of Buta Airways offers additional services such as carriage of baggage, hand luggage, hot onboard meals, check-in at the airport, as well as seat selection in the airplane on a paid basis. One can buy air tickets on "Super" fare, which includes a hand luggage (up to 10 kg), a baggage (up to 23 kg) and free check-in at the airport, from all sales offices. Online check-in on the website opens 24 hours before departure and closes 2 hours before departure. It is free in all fares. Ankara is Turkey’s second largest city after Istanbul. The city is located at the confluence of the rivers Ankara and Cubuk, on the Anatolian plateau. The city is the country’s important political and economic center. 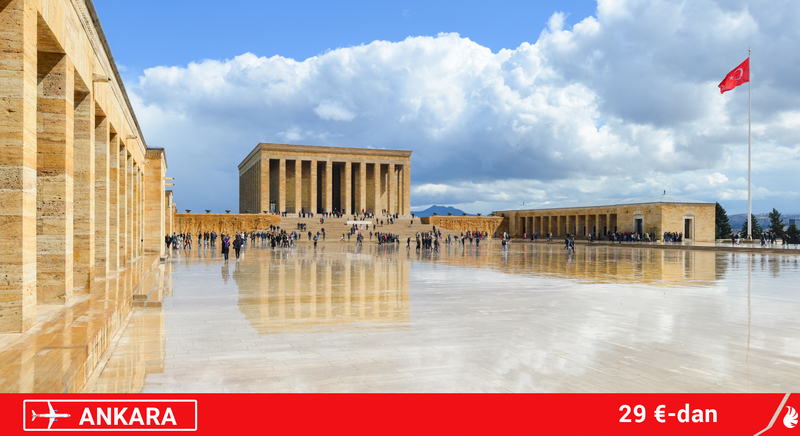 Despite the status of the capital, Ankara is also interesting for tourists. Many ancient sights have been preserved here since Roman times: the Roman baths, Julian's column and the Roman temple. A lot of old buildings were built in Ankara during the Ottoman period, which have been perfectly preserved to this day. Buta Airways is the first low-cost airline in Azerbaijan, a structural subdivision of the CJSC Azerbaijan Airlines (AZAL). It was founded in December 2016. The first flight was carried out on September 1, 2017. The Airline’s fleet consists of modern Embraer aircrafts. The Airline is based in Baku, at the Heydar Aliyev International Airport.